Most people have ditched their New Year’s Resolutions by this time in the year. I’m proud to say that Paul and I are still enjoying our date night resolution! If you’re looking for some fun and frugal date night ideas that allow you to enjoy the spring weather without emptying your wallet, keep reading! Visit your local produce market. Some towns have Saturday morning market festivals with music, food and shopping. When we visit our local produce market, we usually pick out a bottled root beer or orange soda and share it while we relax on a picnic bench in the shade. Plus, it’s always nice to have a strong man to carry my fresh produce! Stargaze in the back yard. This would be a great option if you have children at home. Put them to bed and then sneak out to the deck or patio! Go out for an ice cream treat. We love to split a Junior Frosty from Wendy’s. Cheap and refreshing – you can’t beat that with a stick! There are several parks in our area that have “screen on the green,” with family friendly movies shown for a minimal price. If that’s not an option where you live, take the laptop out to the yard, thrown down some blankets and enjoy your favorite movie or Netflix show under the stars! Attend a church league baseball game. Our church participates in a large church league – and while my husband is on a team this year, I’m sure it would be a fun event to watch with him. Is church league baseball a Southern thing? Do any of these sound like something you and your hubby would enjoy? 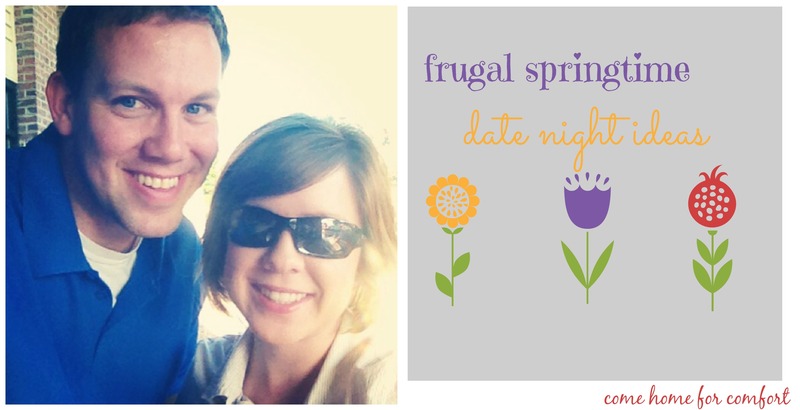 I’d love to hear your springtime date night ideas! I love the backyard stargazing idea! We’ll have to give that one a try. Steve and I love having what we call “Junior High dates.” Basically, the idea is something simple, inexpensive and fun like riding bikes to a not-so-fancy restaurant for dinner, going on a picnic in the park or wading in a local creek together. Our town does free concerts in the park on Friday nights, so we try to make a point to pack a picnic and go. My daughter runs off to play while we share a bottle of wine and dinner, so it always feels like a date. We also occasionally get takeout and drive to a scenic spot to watch the sun go down while we eat in the car. Because we’re home early from this one, it makes it easy to find a sitter, and we really get time to sit and talk without distractions. I love the takeout idea! Restaurants can be so loud and it’s hard to have a good conversation with the TV’s. We will use that one! Thanks for your comment! I love these ideas- thank you for sharing! Well. I write this blog for other people who might not be as “tightly wound” as I am…ha.